Some of Morocco’s Best Kept Secret Valleys and Seacoast Regions for Hiking are location in the provinces of Essaouira, Azilal, Al Haouz, Ifrane, Ourika and Chefchaouen. With its diversity of geography and landscapes, Morocco offers plenty of opportunities to hike and trek. And even less experienced walkers need not miss out on the stunning coastal views, mountain panoramas and picturesque river valleys – there are many shorter or less challenging walks as well as the opportunity to trek on mule, camel or horseback. Here are five of Morocco’s best-kept scenic hiking destinations. A longer stay in Essaouira offers the chance to get out of the medina and explore the surrounding countryside. The Cap Sim promontory, south of Essaouira and between the medina and the small seaside town of Sidi Kaouki, is reachable along the broad sandy beach when the tide is out. 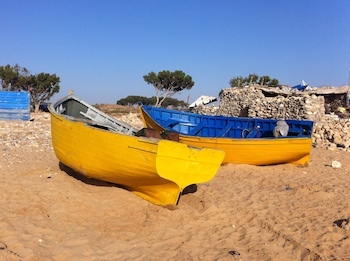 Given the prevailing trade winds from north to south, it is advisable to start in Essaouira and either organize a ride back from Cap Sim or the nearby village of Sidi Ouassane (beyond the lighthouse and home to a large wind farm) or continue to Sidi Kaouki (around 20km/12 miles along the beach from Essaouira) and pick up transport there, rather than turn back into the wind. 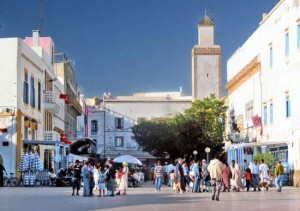 Cap Sim can also be reached overland from the village of Ghazoua (8km/5 miles south of Essaouira). Walkers will be rewarded with views of deserted beaches, rock pools and caves and the occasional herd of goats grazing on the vegetation which clings to the windswept dunes and cliffs. The panorama is particularly attractive at sunset. 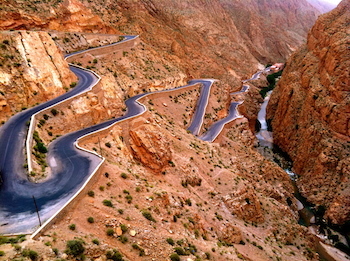 Beyond the city of Azilal, the Provincial capital, a road – only paved since 2001 – climbs up to Morocco’s so-called “Happy Valley” at Ait Bougemez. 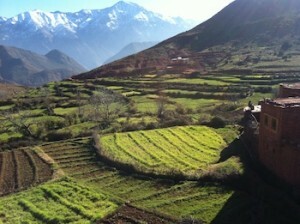 Remote and apparently untouched by many aspects of modern life, it is like a Moroccan Shangri-La. 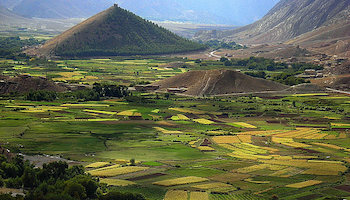 The Ait Bougemez Valley itself is a plateau in the High Atlas Mountains offering plenty of walks alongside babbling brooks where women wash their clothes, beside verdant green fields and under ancient walnut trees on the outskirts of small villages. 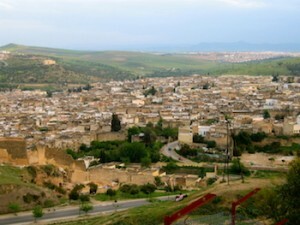 Two cone-shaped peaks rise from the valley floor, one of which is home to the communal granary (agadir) of Sidi Moussa. It is a short, steep hike up to the granary, where a caretaker will happily show visitors around a small museum inside and up to the roof for the stunning views. For the more energetic, Ait Bougemez benefits from its proximity to M’Goun (Morocco’s 2nd highest peak after Mount Toubkal at 4,071m/13,350 ft) and its surrounding massif. Accessible on a day trip from Marrakech, the Ourika Valley is a very popular destination among Moroccans and tourists alike. Typically, day trippers visit the town of Setti Fatma in the valley to eat in a riverside restaurant and hike up to the seven waterfalls, which are easily reached with sturdy shoes via a combination of steps and scrambling over rocks. However, in the peak season this small town becomes overwhelmed with visitors. For those wishing to get off the beaten track and experience a more peaceful hike, Ait Ashok is a recommended destination. Hikers in the Ait Ashok area walk among fruit tree orchards fed by bountiful water flowing off the High Atlas Mountains and between small farming villages. In Spring, when the wind scatters the fruit blossom like snow, a trek is particularly pleasant. Later in the year, hikers can see the harvests of walnuts, almonds, apples and other fruits. The area around Ifrane, in the Middle Atlas Mountain range, is known as the Switzerland of Morocco, due to its altitude which results in snow and skiing in winter. The protected area of the Ifrane National Park covers an area of 500 km² (193 sq. mi) and although the last Atlas Lions are long gone, it is one of the last remaining habitats of the Barbary Macaque monkey. Hikers in this region walk among huge forests of Atlas Cedar, where the birdlife is unparalleled. Ornithologists can expect to see birds of prey such as the red kits and common kestrel and the lakes in the park also support several duck species. In the North of Morocco, in the foothills of the Rif Mountains and near the Mediterranean Coast, the area around the famous blue city of Chefchaouen is protected under the auspices of the Talassemtane National Park. The park covers some 145,000 hectares (358,000 acres). 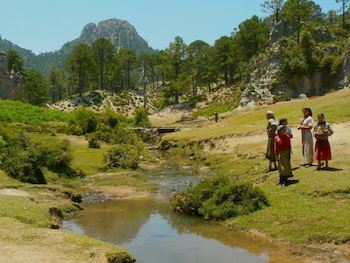 Hikers can either organize day hikes from Chefchaouen or undertake longer trekking excursions, staying within the park itself in a number of guest houses or in tents. The local environment is home to Rif Monkeys as well as countless native bird varieties and plant species, many of which are endangered. A popular destination for a day hike is the Akchour Falls and/or the Bridge of God. As long as the river is not in flood, various paths take walkers along the river banks and over a couple of hills. Routes can be selected according to fitness level and desired length of hike and in the peak season there are cafes on route where the weary can rest and enjoy a riverside tajine. The easiest hike is to God’s Bridge, a steep gorge at the base of which the river flows and which is spanned by a wooden bridge. No matter your fitness level, Morocco’s diverse countryside of coasts, mountains and valleys is easily accessible and enjoyable. Hikes and walks of varying durations and challenge level can be arranged in many regions. It really is worth getting out of the cities to enjoy Morocco’s beautiful nature, stunning vistas and perhaps the hospitality of a rural Berber family along your route. 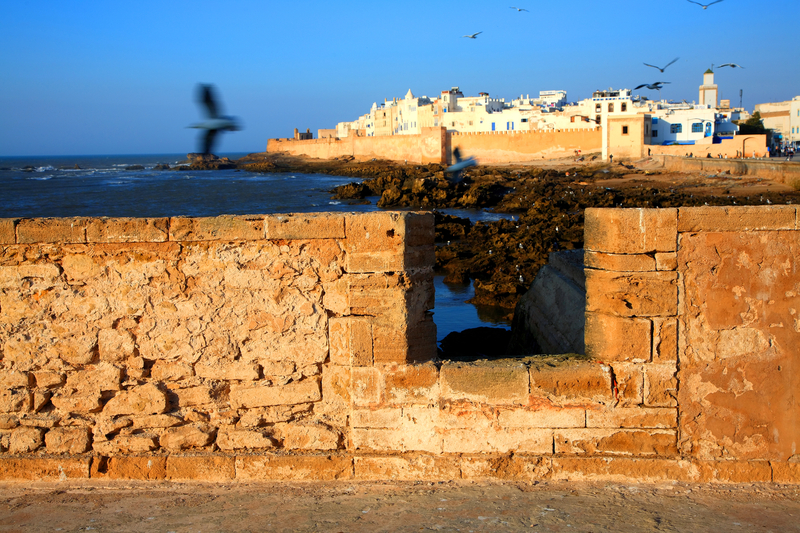 Essaouira owes much of its past, present and future to its situation on a bay sheltered from the fierce trade winds of the Atlantic Ocean by an archipelago of small, rocky islands. Towards the end of the 18th century, Sultan Sidi Mohammed Ben Abdullah (Mohammed III) created a strategic role for Essaouira in his new trade policy oriented towards the Atlantic. He instructed the construction of the Kasbah (King’s Quarters) and the Skala fortifications which became the basis for the medina (old city) we see today. He ordered the closure of Agadir harbor, further south, and effectively routed a large amount of trade between Europe and West and Central Africa through his new port. The Sultan was the first Head of State to recognize US Independence in 1776, thereby creating a strategic linkage in support of his trade objectives in Morocco. In order to ensure the success of his strategy, Sidi Mohammed Ben Abdullah invited 10 prominent Jewish families from the key commercial centers of Morocco to settle in what was known then as Mogador and manage the trade. These families were largely the descendents of those expelled from Andalusia at the end of the 15th century and had gained a strong reputation for their skills as merchants. They became the “Tujjar as-Sultan“, the Sultan’s traders. These families – and many foreign consuls and negociants – settled in the newly-built houses of the Kasbah, which featured typical Swiri architecture of rooms set around a colonnaded interior patio, the latter often large enough to accommodate merchandise. Such buildings can be seen in the area near Bab el Minzeh and Bab Sbaa and along Rue Laalouj, where the French Institute and Sidi Mohammed Ben Abdullah Museum are excellent examples. 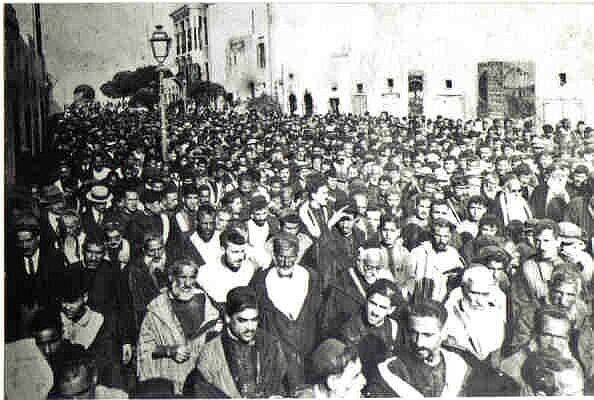 By the start of the 19th century, the population of Essaouira was majority Jewish. There were as many as 40 synagogues. 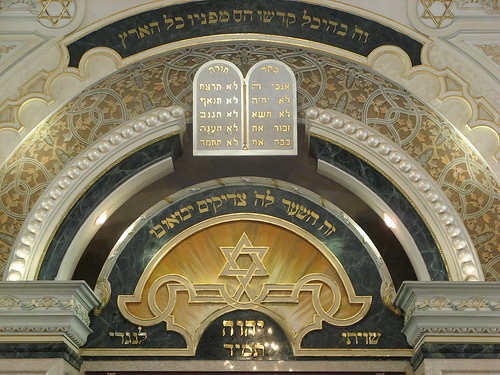 Some, like the Simon Attia synagogue were the private synagogues of a large family, while others, such as the Slat Lkahal, were community centers of worship. As the affluence of the city grew, it attracted many migrants from the rural areas, seeking economic opportunities. The Mellah, a typical feature of a Moroccan city and a principally Jewish neighborhood, was built to house these families. Essaouira also had a Mellah Kdim, the “old Mellah”, which was an extension of the Kasbah and housed the Jewish middle classes. Mogador was unique in Morocco in that Jews, Muslims and Christians – those of Jewish, Berber, African, European and Arabic descent – lived side-by-side. There was a fruitful exchange at all levels of society, from artisans like silversmiths passing on their trade, to the interchange of intellectual and musical influences such as seen in the Andalusian music which continued to be taught and performed in Mogador long after the flight of Jews and Muslims from the Iberian Peninsula. 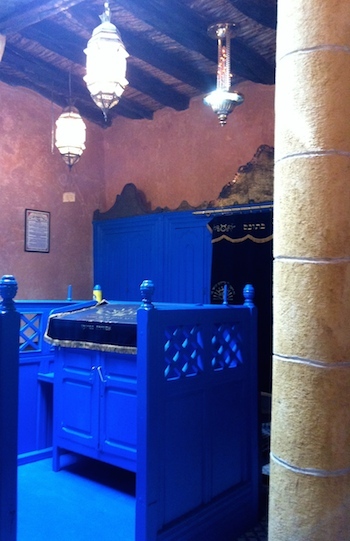 Today, there are a number of Jewish sites which can be visited and/or are under renovation in Essaouira. 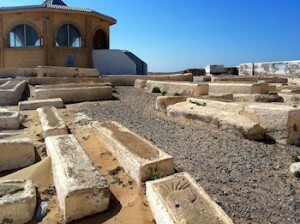 Essaouira’s two Jewish cemeteries are open to visitors by calling the number of the guardian posted on the door. The older of the two is only separated from the sea by a wall and is regularly inundated. 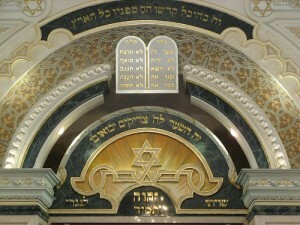 It features the mausoleum of Rabbi Haim Pinto (1748–1845), which is the subject of a hilloula (pilgrimage) every Fall. The graves are often laid on top of each other and the inscriptions are no longer legible. All that remains are circular or triangular symbols indicating whether the occupant was male or female. The ‘new’ Jewish cemetery, across the street, was opened in the 18th century to accommodate the growing population. It is the final resting place of a number of rabbis, intellectuals and musicians as well as many of the ‘ordinary’ residents of Essaouira-Mogador. The cemetery tells the stories of many great families of Mogador such as the Corcos, the most famous of the original ‘Sultan’s merchants’ and the Yuly and Levy families – some of whom are certainly ancestors of the first Jewish US senator, David Levy Yulee. The guardian of the cemeteries can also grant access to the Haim Pinto synagogue, just back inside the medina at Bab Doukkala, in the Mellah. The neighborhood is part of an urban clearance program and the synagogue, although thoroughly renovated inside, sits in a precarious position surrounded by crumbling and decaying buildings, the former homes of Jewish families. Just a few doors along, back towards the central medina, is Slat Lkahal, a community synagogue currently under painstaking renovation by Haim Bitton, helped by the generous donations of members of former Mogador Jews. Those who are lucky to meet him there will learn of the intricate connections between Jewish communities in Manchester, London, Italy and Mogador. So far, he has managed to rescue key elements of the original synagogue from demolition and is carefully restoring them using local artisans. He hopes to turn rooms on the upper floor into exhibition and meeting spaces. 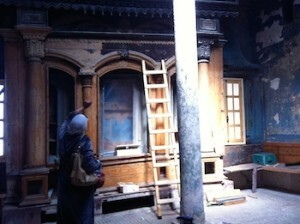 Back in the Kasbah, the Simon Attia synagogue is the subject of an ambitious restoration program. Once also the Rabbinical Court of Mogador, the aim is to restore the space used for worship on the ground floor and create a library of documents related to Moroccan Judaism alongside accommodation for students of these works upstairs. Most of Essaouira’s synagogues are long gone. Few have actually been demolished, but most have passed into alternative uses and only the older members of the Mogador Jewish diaspora recall their location. 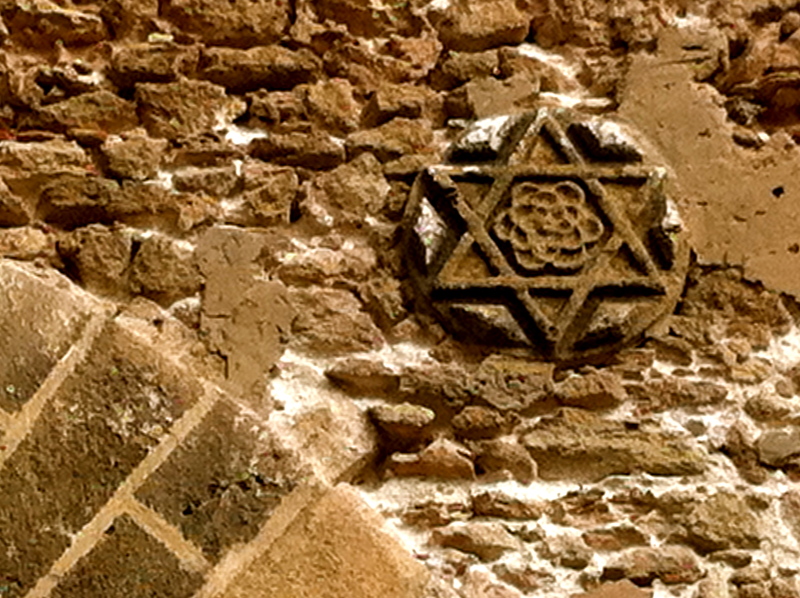 There are still plenty of clues to the size of the former Jewish population of Essaouira, however. 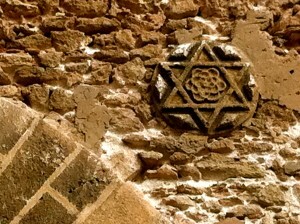 A wander around the labyrinthine alleyways of the Mellah or Kasbah will reveal several doorways with the Star of David on the lintel and a conversation with any of Essaouira’s older residents will reveal the proximity and goodwill of the Muslim and Jewish communities in times gone by. Every year, the sun-bleached, windswept city of Essaouira on Morocco’s Atlantic coast plays host to a festival of Gnaoua and World Music. 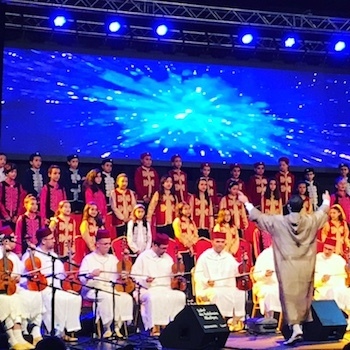 Normally it is held in June, but this year’s 18th edition will take place – like many of the main Moroccan music festivals – in May, to avoid a clash with the holy month of Ramadan. The dates for this year’s event are 14-17 May 2015. The principal feature of the festival is the celebration of Gnaoua music and rituals. The Gnaoua movement is a form of Islamic Sufism. The roots of Gnaoua (or Gnawa) lie in sub-Saharan Africa and reflect pre-Islamic traditions. Successive Moorish sultans brought African slaves to Morocco and their traditions became integrated into Islamic Sufism. Gnaoui (as practioners are known), like other Sufis, are organized into brotherhoods gathered around a Master, or maalem. These brotherhoods are based in a zawiya – a center of religious teaching, healing and practice found in towns and cities across Morocco. Sufis are known for their communion with God (Allah) through rituals such as music or dancing based on repetitive rhythms, known as samaa. The gnaoua hold spiritual events known as a lila, where the objective is for participants to reach a trance-like state of ecstasy to reach deeper spiritual knowledge. The lila rhythms and rituals are said to call up ancestral spirits to drive out evil and cure ills. A typical instrument of the gnaoua is the gimbri, a three stringed bass lute covered in camel skin. The skin creates a deep reverberation, creating the soul-stirring basis of gnaoua music. The maalem typically plays the gimbri seated, singing the verse of a song (typically praising Allah or venerating a gnaoua saint). A chorus line of young adherents respond to his call while playing a percussive rhythm on the krakeb, iron castanets said to echo the sound of the slaves’ chains. As their clackety-clack beats hasten, the rhythm reaches a crescendo and Gnaoui may enter a trace or break ranks to demonstrate acrobatic dancing and whirling. At the Gnaoua Festival in Essaouira, the audience has an opportunity to see both the brightly-colored, energetic spectacle of Gnaoua groups performing on large open-air stages (on Place Moulay Hassan and near the beach) as well as at more intimate concerts which simulate some of the atmosphere of a lila in smaller venues such as Dar Souiri or a zawiya. The best venue for the late night, smaller, concerts is the Borj Bab Marrakech. Lying on rugs and cushions under the stars, within earshot of the waves crashing on the beach and with seagulls calling and swooping overhead, a special atmosphere is created for some of the best known artists on the program. 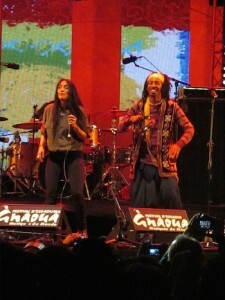 As well as offering the opportunity to see the best of local Swiri gnaoua maalems and their groups, such as Tyour Gnaoua with Maalem Abdeslam Alikane, brothers Maalem Mokhtar and Maalem Mahmoud Guinea or Gnaoua rockstar Omar Hayat, the festival also an insight into the full diversity of Moroccan Sufi music – such as the more traditional and contemplative style of the Hmadcha of Essaouira; the drum-led beats of the Issaoua brotherhood from Fes, or the modern fusion style of Maalem Hamid el Kasri from Rabat. The festival program is interspersed with performances by international artists. At the end of each evening on the main stage is the highlight – a fusion concert between one of these invited musicians and a Moroccan Sufi group. These spectacles are remarkable not only in their combination of musical genres and traditions, but also in the collaboration between artists of very different spiritual, religious and cultural traditions. Invited guests this year include Afrobeat veteran, Nigerian drummer Tony Allen; Guadeloupian percussionist, Sonny Troupé; the latter’s sometime collaborator, US jazz saxophonist and flautist Kenny Garrett, and long-standing Gnaoua Festival supporter and collaborator, Franco-Algerian drummer Karim Ziad. 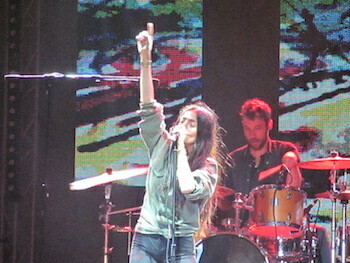 Those seeking a sample of Morocco’s diverse modern music scene, will want to catch Darga, a band from Casablanca playing a fusion of gnaoua, traditional and Western styles on the beach stage or Hindi Zahra, who has been compared to Norah Jones and Patti Smith, on the main stage. The Festival opens with a spectacular parade of giant marionettes and all the participating Sufi groups on the Thursday afternoon. Seek out a position early on the main street through the medina from Bab Doukkala and get your camera in position! Alongside the main concert program are also events such as the Forum – a seminar series, this year about African Women – and the Arbre à Palabre discussions held at the French Institute. This year there will be a smaller stage with afternoon concerts at Bab el Minzeh near the port. The open air concerts (on Place Moulay Hassan, at Bab el Minzeh and at the beach) are all free, although they can get crowded at night. VIP passes for an enclosed area near the stage can be purchased on site. The intimate concerts are ticketed (for example, concerts on the roof of the Borj Bab Marrakech at 250 dirhams) and places are limited. Essaouira’s range of festivals throughout the year (such as the Alizés Festival in April and the Andalusian Festival in the Fall) highlight the melting pot of musical and cultural influences that is Morocco, but the Gnaoua World Music Festival is unparalleled in its showcasing of gnaoua music in its original form as well as in fusion with a range of world music styles. 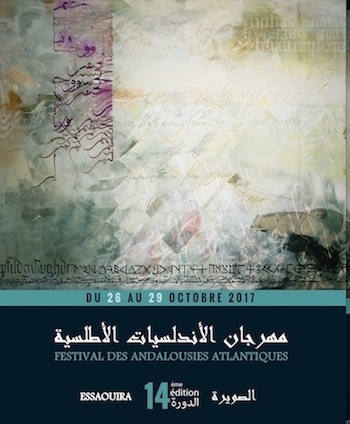 If you are in Morocco this May, don’t miss it! Morocco is such a photogenic country. The Best Times to Travel to Morocco and discover the 6 Best Views is spring and fall. The bright, Mediterranean sunshine makes for a special light, whether you are photographing deserts, mountains, cities, dunes or coastal scenery. The colors of the natural elements, the architecture and the handicrafts such as carpets, highly polished teapots, hand-stitched and embroidered leather babouches slippers or flowing caftans make for great subjects, as do the people and animals of Morocco. It’s best to always ask before taking someone’s picture and don’t be offended if they refuse given many Moroccans are modest and private. Morocco also has several stunning vistas which you will want to snap during your trip. Here is a lowdown of where to go to capture the six best views of Morocco. The ancient capital of Fes is such a dense, labyrinthine city that when you are in it, it is hard to imagine getting an overview of the place. To get the best view, it is necessary to climb above the hustle and bustle of street level, to get away from the jostle of the souk and rise above the walls. The best place to do this is actually outside the medina (old city) at Les Merinides Hotel. Situated on a hill overlooking the medina, this five-star hotel has three restaurants (La Kouba du Ciel on the top floor; L’Impérial French restaurant and La Terrasse de Fès at the poolside), all of which offer panoramic views of Old Fes. The main draw of this most holy of Moroccan cities is the mausoleum of Idriss I, the founder of the Kingdom of Morocco and credited with the introduction of Islam to this north western corner of Africa. The mausoleum occupies a large footprint in the medina, but is not accessible to non-Muslims. 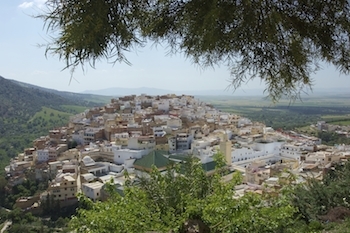 However, it is still worthwhile stopping at Moulay Idriss and hiking up to the highest point in the medina to look down on the huge mausoleum complex with its mosaic patios and glazed green roofs. From here, it is also possible to see the full extent of the ruins of the Roman city at Volubilis, just a few miles away. 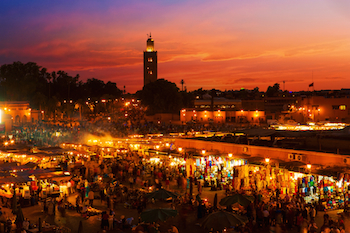 The most special moment in Marrakech occurs just before dusk. Pick your spot on a roof terrace in one of the many cafes which surround Place Jmaa el Fna and watch the magic unfold. As the sun begins to set, the hawkers and street food vendors roll their mobile stalls onto the square to set up for the night. As the call to the sunset prayer sounds from the Koutoubia mosque’s minaret, the electric bulbs of the food stalls illuminate one by one, until the natural light has gone and the square is lit by hundreds of twinkling lights. Get to your chosen cafe early to secure a front-row seat and snap the sun setting behind the Koutoubia. 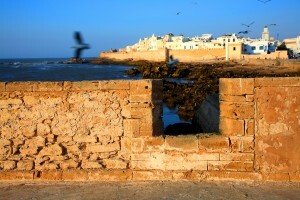 The classic picture of Essaouira, which you will find on postcards all over town, is shot through a round window in the fortifications (skala) of the port. Entrance is 10DH and as well as great views looking back to the white-washed medina, you will get an aerial view of the functioning port and the canons lining the crenulations, as well seeing swooping seagulls and the islands out in the bay. For the best sunset views, head to the medina skala, or one of the many bars and restaurants along the beachfront, and wait for the sun to sink into the Atlantic. The best views of the stunning Dades Gorge are from the Auberge Chez Pierre, in the gorge itself. The ochre and red landscapes are an essential sight on your route to Zagora. Even if a night at Chez Pierre isn’t on your itinerary, it is worth stopping for lunch or a drink on their terrace. The hotel is built in the traditional local style amid terraces of fruit trees, offering fantastic views of the surrounding gorge. It is not always easy to get an accurate impression of the sheer size and majesty of the magnificent Erg Chebbi sand dunes. However, the Yasmina Hotel offers unbeatable views due to its sheer remoteness. It is located right on the edge of the dune complex and the slightly longer drive from all sense of civilization is worth it for the absolute peace and calm that gives visitors a true feeling of the vastness Great Sahara. The best views of the dunes are at sunrise and sunset. For this reason, you may not choose to sleep at Yasmina – many guests use it as a stopping point before heading into the dunes on camel-back for a night under the stars in tents. This list is offers edited and subjective highlights of our favorite views. On your Morocco trip you will certainly experience many others, take many photos and create special memories for the years ahead. Feng Shui Your Way to Morocco for an eight-day retreat with best selling author Jayme Barrett. Experience how the laws of energy can be utilized to enhance your life. A Feng Shui travel retreat is an ideal way to discover Morocco’s great spaces within the “red hamra” city of Marrakech, the Ourika Valley and seaside Essaouira. Feng shui is a Chinese system of geomancy believed to use the laws of both Heaven and Earth to help one improve life by receiving positive energy. The term feng shui literally translates as “wind-water” in English. Historically, feng shui was widely used to orient buildings—often spiritually significant structures such as tombs, but also dwellings and other structures—in an auspicious manner. 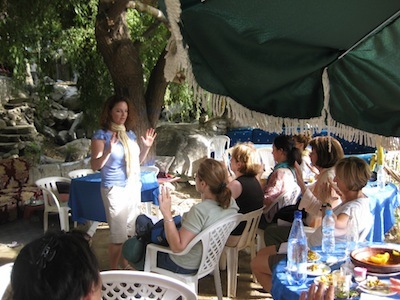 This Morocco retreat with Feng Shui expert Jayme Barrett pays homage to the practice of Feng Shui in culminating the wind-water intention through private group teachings and activities. Participants can anticipate enjoying two Feng Shui workshops, two energy/life-enhancement classes and one manifestation & meditatation class taught exclusively by Jayme. The retreat will take place in an 18th century Moroccan Riad courtyard in the heart of the Marrakech medina. 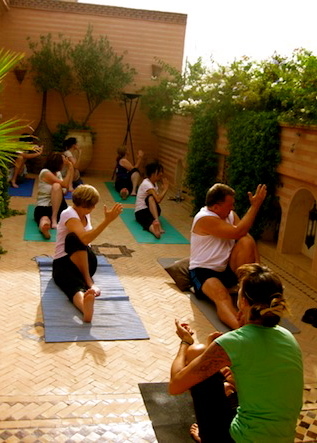 Amenities and unique experiences include a daily yoga practice, walks in the Ourika Valley, shopping in the souks for Moroccan decor, a visit to the North African coastal town of Essaoauira, endless opportunities to dine on Moroccan delicacies plus a Moroccan cooking workshop and Spa treatments. The Feng Shui Morocco retreat also offers free time to explore on your own in Marrakech and its surrounding areas. A visit to the Marrakech Majorelle Gardens designed by Jacque Majorelle and its newly reopened Museum that showcases Berber jewelry and clothing traditions should be top on the list. Relish at sunset with Cocktails at La Mamounia Hotel & Gardens or take an extension trip to the Great South. An extension trip to the Great South includes an overnight camel trek in the Sahara Desert’s Erg Chebbi Dunes, bread baking, henna time and lunch with a Berber family plus a full day visit to Ait Benhaddou Kasbah and the regions old Ksars. 2. Buy from local craftsman and artisans. Supporting their creativity and offering a fare price is good karma. Also, it’s better to own hand-made objects such as woven baskets and rugs. They contain life force energy, as opposed to machine-made objects. 3. Remember what you want to manifest in your life, and find mementos that represent your passions and desires. For example, to boost romance, buy in pairs, such as two candlesticks, pictures or figurines. To encourage fertility and pregnancy, find a hand-made doll crafted by a loving mother. To increase spirituality, bring home a religious relic or statue. To boost wealth, buy a special gold box to house your written intentions. Before you can apply good feng shui you must know what you want to manifest in your life. 4. Look for stones and shells that contain nature’s healing energy. 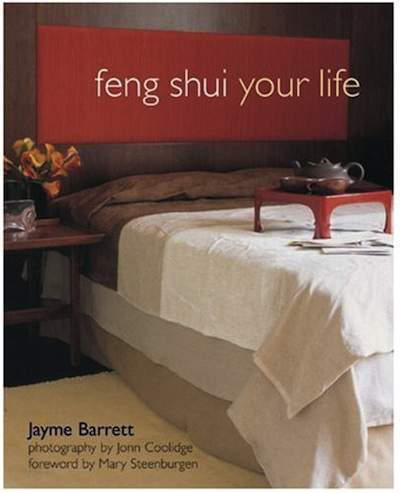 As seen on “The Today Show, best-selling author Jayme Barrett is a leading authority on Feng Shui living and personal fulfillment. Jayme empowers individuals to design their lives for increased balance, energy and motivation. Jayme’s book, “Feng Shui Your Life” is the #1 most popular feng shui book. Barett’s clients include Hollywood actors, TV directors, successful fashion designers and movie executives, attorneys, hotels and spa owners. Barrett has been featured in magazines including Body + Soul, Self Magazine, Health, ELLE, Woman’s World, Redbook, First for Women, Parents, Healing Lifestyles and Spas, Delicious Living, The Nest, Every Day with Rachael Ray, American Spa and Healthy Living Magazine. 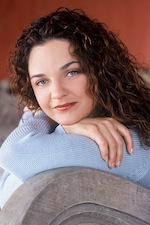 Jayme Barrett resides with her husband in Los Angeles, California. Travel Exploration specializes in Morocco Travel. 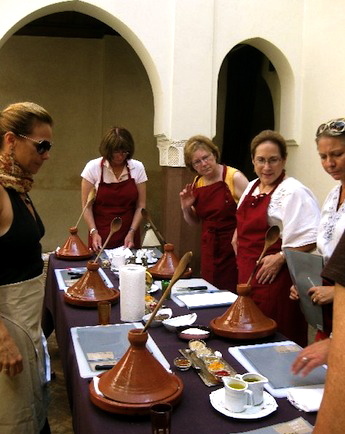 We provide Tours and travel opportunities to Morocco for the independent traveler and tailor-made tours for families and groups with a distinctly unique flavor. From Morocco’s Seven Imperial Cities, to the Magical Sahara Travel Exploration offers a captivating experience that will inspire you. 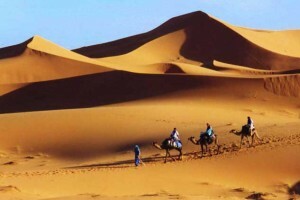 At Travel Exploration we guarantee that you will discover the best of Morocco! 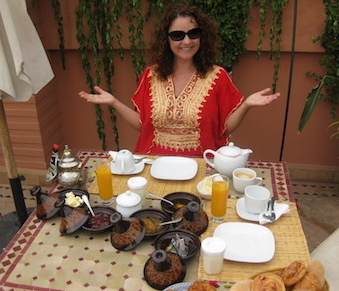 Call Travel Exploration at 1 (800) 787-8806 or 1 (212)618-8861 and let’s book a tour to Morocco for you today. Once in a while we come across a person in our lives that allows us to understand the meaning of dignity. It is Mustapha El Harchi, a disabled painter by mouth from Morocco’s seaside artist colony of Essaouira that serves as a reminder how self-dignity and self-preservation of the soul are free. I first met Mustapha El Harchi five years ago. I was strolling just past the wide entrance to Essaouira’s old medina and walked right past him. I did a double take, then circled back. It only took a glimpse of Mustapha painting by mouth for an immediate recollection of Jim Sheridan’s film “My Left Foot” staring Daniel Day-Lewis. Thus began a story of acknowledgement and friendship. 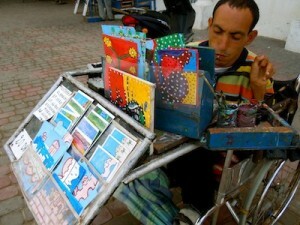 Musapha El Harchi paints daily at his outdoor stall which consists of his wheel chair, a make shift easel, his paints and a carry bag of his things. He parks himself across from Taros restaurant and just around the corner from the Casa Villa, a famous Essaouira café known for the best espresso in town. Each time the opportunity arose and I would return to Essaouira my first visit in the old medina would begin with visiting Mustapaha. I secretly admired his sense of dignity, calm and organization as he painted by mouth. I always make a point of telling Mustapha that a view of the Atlantic Ocean along with a daily routine of painting in the serene town is the truly a good life. Mustapha typically smiles agreeably with a laugh, while gesturing to the tourists and locals who pass by his creative make-shift art stall. 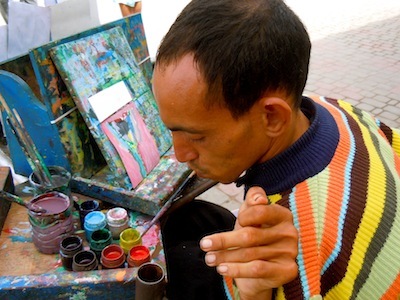 Mustpaha and his paintings qualify top rate under a list of “what to see and do in Essaouira.” A visit with him is equally as rewarding if not more then a visit to other local galleries or even Orsen Wells Square. Mustapha’s out door stall is meticulously filled with new, small works of naïve paintings ranging from seascapes to floral designs, and agricultural landscapes all available for a modest 20 Moroccan Dirhams. 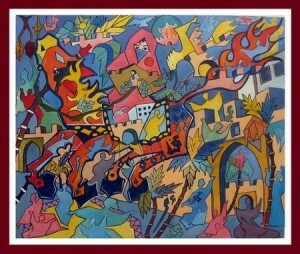 Over the years, I have collected many and often give them away sharing the story of the artist. 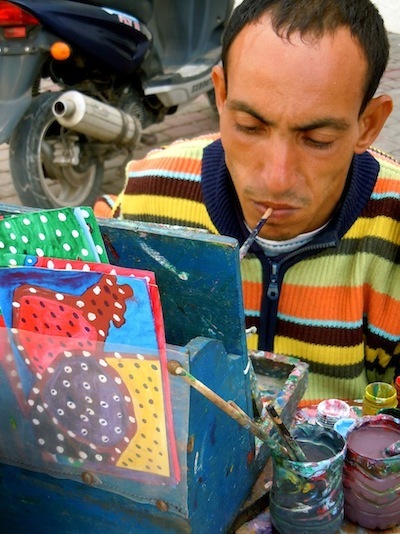 I began collecting his pieces because I enjoyed the idea of contributing to Mustapha’s form of artistic expression. For years I wanted to photograph Mustapha El Harchi and I also thought about making a short film. On my last trip to Essaouira in September 2011 we agreed that it would be a nice idea if I photographed him with the goal to share his story. Mustapha and I also decided that allowing foreigners have a small piece of his work would be a nice way to remember both him and Essaouira. Our solution was to give everyone who embarks on a tour with Travel Exploration a gift – a hand painted post card by Mustapha El Harachi, painter by mouth. Mustapha El Harchi can be reached at the address listed below. 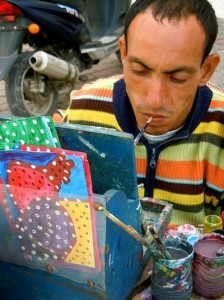 If you’re visiting Essaouira, make sure to stop by and see him. He is fond of art books and collects them as inspiration for his works. To make a donation you can send him an art book of flowers, rural landscapes and still paintings. He would be very grateful indeed.